It's Friday, and what better way to bring in the weekend than another scary clown image! 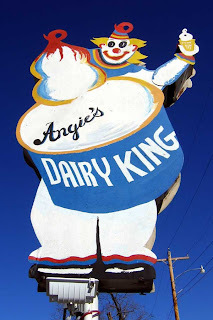 There's something about the placement of the ice cream on the clown, its angle, and the red tip that really bother me. Har-de-har-har! You think you're so clever. What's not clever? #1 the sign is in Richland (not Richmond), MO and #2 you stole the photo from a friend. No permission. No credit. It's all about you, isn't it? If you were a nice person, you would remove the photo.